Since starting 75th +Sedgwick, we've had a few readers reach out to us asking for casual advice on topics such as decor, art and party planning. We are so flattered by this! We rely on each other (duh) and our friends DAILY for advice about, well, everything! So we decided to start a new series for the blog! ...Ultimately, if I can avoid pastels, I must. I just can't take it. 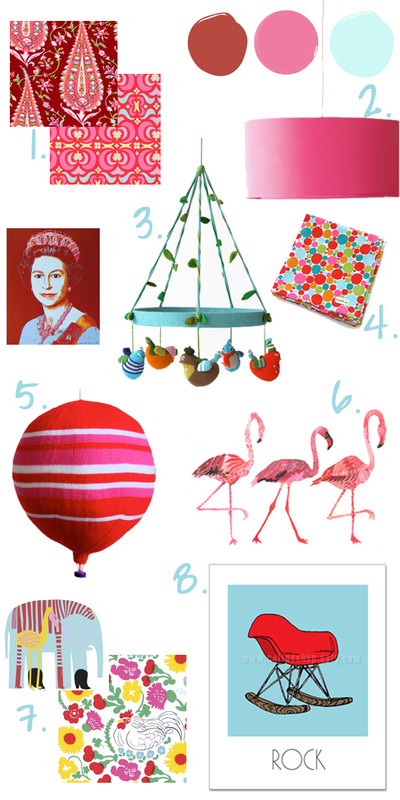 So I'm leaning towards poppy red, hot pink and a tiffany blue for the nursery. My question for the ladies of 75th and Sedgwick is, am I insane? Does this go? Will my daughter develop psychological issues because of such color choices? Any thoughts, suggestions, etc. would be oh so appreciated, since I have no idea if I'm decorating anymore or if my hormones are. Attached is a pic that first got me thinking about red and pink: The Queen pic is just the colors I want, but a pic of the Queen? Really? Is that obnoxious? Not sure if it works for a nursery... Okay, let me know what you think! To Emily we say: Yippee! We love this color scheme. Even though the colors are pink and blue, this combo seems unique, refreshing and awesome. Red and pink are a-ok by us, clearly! We feel the way to do it is to pick one or two main colors and then add in pops of the third color. An even amount of all three colors can sometimes create a circus-like feel, don't you think? 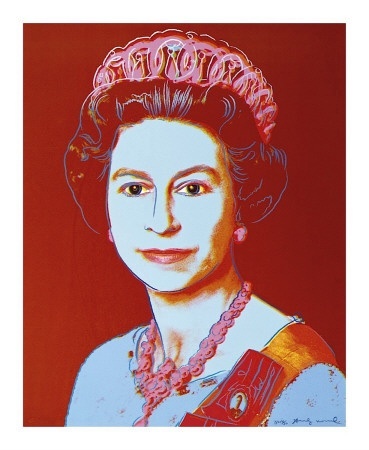 We love the Queen print as a nod to baby's British roots (Emily's husband is British). Because we love nurseries but feel creepy looking at them without good reason... we even took this opportunity to gather some ideas for you! Check it out, mama, and keep us posted with your progress! Ohhh, I LOVE. You ladies are my new go-to source for all things decorating! This is fab, thanks so much! Yay! So glad you like it Emily! I can't wait to see what you guys do! Someone you know well was raised in a room with primary colors--not pastels and I think he turned out pretty awesome--Go Bold!!! Whoo-hooo! You commented! Just made my weekend. Thank you so much! Too funny that he had a bright nursery and I bet it contributed to his creative qualities!